According to the just-released results of a recent survey conducted by real estate brokerage TheRedPin, major intersections play host to the costliest condominium units in downtown Toronto. The study, which covered 24 key intersections in the city, found that the major factors driving elevated prices in these areas include the presence of “key retail destinations” and direct access to transit. Pricing information was culled from data on sales between August 2015 and August 2016. All in all, the average sale price for 1-bedroom condos in the 24 areas surveyed sat at $433,823, with a median price of $638,491. “Bloor and Avenue was found to be the most expensive downtown intersection to own a condo, with 1 and 2 beds priced at $611,327 and $1,379,140 respectively,” TheRedPin stated in its report. However, while these costs might seem elevated, the brokerage emphasized that condos still represent a less prohibitively expensive option, especially in light of the still-soaring averages in the detached and semi-detached sectors. In a report earlier this month, the Toronto Real Estate Board said that housing sales prices in the city continued to soar in September, with the average price rising 20.4 per cent year-over-year to $755,755. The price increases came as the number of transactions in the Greater Toronto Area rose 21.5 per cent, a stark contrast to a big drop in the number of transactions last month in Vancouver's residential real estate market. 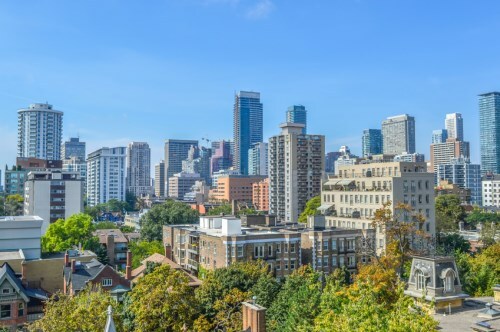 TREB noted that there was strong growth in sales transactions for all major home types in the region, but a lack of supply growth in the city of Toronto itself.